The basic objective of this study is to assess corrosion behavior of steel bars in concrete members by nondestructive method of testing. Corrosion possibility is assessed by half-cell potential method (using CANIN) while resistivity meter (RESI) is used to estimate risk of corrosion of rebars in concrete members. Interestingly, higher half-cell potential indicates more possibility of corrosion, but higher value of resistivity indicates lower probability of corrosion. 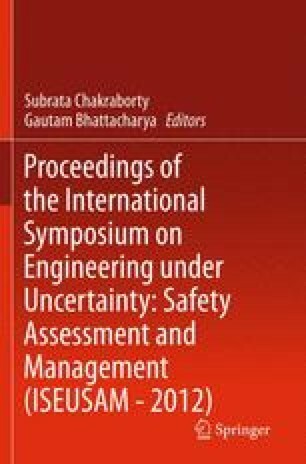 An extensive research program was undertaken in order to assess risk of corrosion using type 1 (Fe415:TATA-TISCON), type 2 (Fe500:TISCON-CRS), type 3 (Grade Fe415:ELEGANT steel), type 4 (Fe415:VIZAG steel), and type 5 (Fe500:SRMB steel) TMT steel bars of 16 mm diameter with M20, M40, and M60 grade concrete samples, prepared with OPC exposed both in AIR and NaCl for a period of 900 days. Taking only average values of experimental data, initially huge uncertainties were found. Secondly, after applying standard statistical method, uncertainties were slightly reduced. Third analysis was then taken up by modifying standard statistical process; satisfactory results were still not obtained. Then, fourth analysis was carried out with optimum values to minimize the uncertainties. Three-dimensional graphs for each case were plotted using MATLAB, an ANN-based software. More appropriate ANN-based software is required for better correlation.